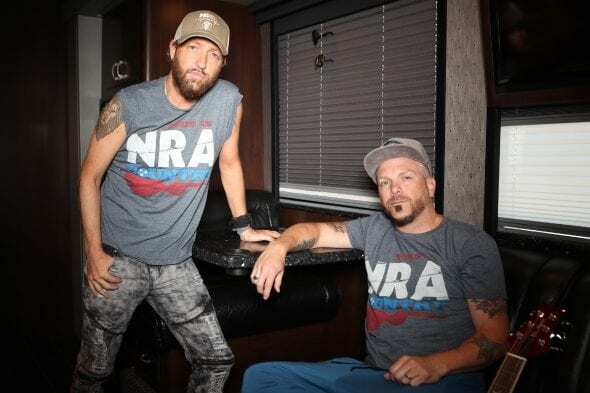 Nashville, Tenn. – NRA Country has named chart-topping Country duo LOCASH as the Featured Artist for September. Throughout the month-long promotion, fans can enter for a chance to win two tickets plus meet and greet passes to an upcoming show as Preston Brust and Chris Lucas continue to crisscross the U.S. promoting their upbeat, committed smash single “Ring On Every Finger.” Details about the contest will be shared with fans later this month in conjunction with a big concert announcement. A special, exclusive Q&A about their love of the outdoors is currently available at NRACountry.com. “I grew up in Baltimore and would go to the ocean almost every weekend. On the way to the Eastern shore, the duck, deer and turkey hunting was incredible. My uncle, cousins and all of us would go crabbing and fishing as well, so the outdoors have been part of my life for years and I’m so proud we’re NRA Country artists,” shares Lucas. Brust adds, “My Dad taught me everything I know about the outdoors. He taught me very early on all about deer hunting, to respect the land and how to be a good hunter. The lessons I learned from him will always be with me and they are the same lessons I’ll pass down to my kids. That’s what it’s all about. And I’m proud to be NRA Country!” LOCASH’s Preston Brust said. The Reviver Records’ talented pair has proven to be nothing short of unstoppable since their #1 smash, “I Know Somebody,” catapulted LOCASH into the national spotlight. The infectious song follows GOLD-certified single, “I Love This Life,” which climbed to No. 2 on Billboard’s Country Airplay chart. As an NRA Country Featured Artist, LOCASH joins some of country music’s biggest acts including Hank Williams Jr., Florida Georgia Line, Lee Brice, Justin Moore, Gretchen Wilson, Aaron Lewis, Chris Janson, Dustin Lynch, Aaron Watson, Michael Ray, Granger Smith and many more, in teaming up to celebrate their support of our brave men and women in uniform, appreciation for the great outdoors, and love of family. For a more information and a complete list of tour dates, visit locashmusic.com. Respect. Honor. Freedom. It’s a lifestyle and a bond between the best and brightest in country music and hard-working Americans. NRA Country is powered by pride, love of country, respect for the military, and our responsibility to protect our great American lifestyle. NRA Country celebrates these values with concerts and events benefiting military and veteran services organizations, first responders, conservation organizations, firearm safety programs, and local charities making a difference in their communities. Get NRA Country Connected at www.nracountry.com and get the latest artist info and exclusive events on Facebook, Twitter, and Instagram. Hit making Country duo LOCASH continues their energetic ascend to the top with current single “Ring On Every Finger” already on the verge of Top 20 at Country radio. Serving as the third single from their Reviver Records debut album, THE FIGHTERS, the project has delivered GOLD-certified smash “I Love This Life” and hook-heavy #1 hit “I Know Somebody.” Nominated for both an ACM award (New Vocal Duo or Group of the Year) and a CMT award (Duo Video of the Year) in 2017, the “separated-at-birth singing partners” (Rolling Stone) have wowed national audiences with their high-energy hits on TODAY, Jimmy Kimmel Live! and more. LOCASH – comprised of Chris Lucas (Baltimore, Maryland) and Preston Brust (Indianapolis, Indiana) – double as prolific songwriters, having penned mega hits for the genre’s biggest names including Keith Urban (“You Gonna Fly”) and Tim McGraw (“Truck Yeah”). The dynamic twosome have scored opening slots with Toby Keith as well as Tim McGraw and Faith Hill’s SOUL2SOUL TOUR, and are currently crisscrossing the country with select headlining dates. For more information on LOCASH, visit www.LOCASHmusic.com.